Wanted, entrepreneurial hospitality recruitment professional! Welcome to a completely different kind of profession. Are you passionate about the hospitality industry and human resources management? 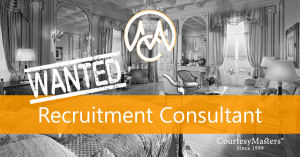 Become Hospitality Recruitment Consultant at CourtesyMasters. Call and email us now!